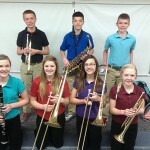 The Pope John XXIII Central Catholic junior high band recently received honors at a northeast Nebraska contest. They performed at the Wayne State College Middle School Solo & Ensemble Festival on March 10th. The full band received a superior rating on their two selections. The following students received superior ratings on their solos: Kyle Schumacher (trumpet), Luke Henn (alto saxophone), R.J. Lierman (snare drum), and Faith Kinney (trumpet). Also receiving superior at that contest were Breanna Bartak and Haley Zegers on their trombone duet. Kayce Kallhoff performed at the Elgin Band Contest on March 21 and received an excellent rating on her clarinet solo.